On my own coffee "problem"
SJ's discussion of the campus Starbucks and her coffee addiction got me to thinking about my own coffee "problem." It was just down the street from the guesthouse we lived in. Even then, I put sugar - and sometimes cream - in my coffee (Viennese coffee is incredibly strong. Spoon standing up strong). It wasn't until grad school, when I studied for my PhD exams that I gave up the sugar in my coffee. I decided that somehow the sugar made it "less powerful." I know it doesn't make sense, but I gave up the sugar and started drinking it black. At my worst - during exams and during some really intensive sessions of dissertation writing - I get up to about 1.5 to 2 pots of coffee a day. Lately, though, I generally manage to only drink one pot a day, at most. And I wonder why I sometimes have difficulty sleeping. 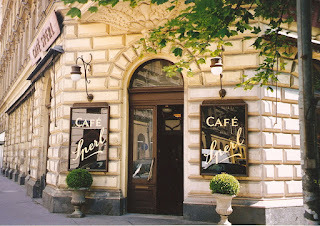 Labels: addictions, Cafe Sperl, nice pictures, nostalgia, Random thoughts, Vienna, where's my coffee?